Which Countries Have the WORST Immigration Laws? Financial Reform or Political Pabulum? Seemingly endless Senate negotiations are formulating the Financial Reform Bill, but the process is anything but transparent. Despite the uncertainty over the final format, it is a near certainty that the Bill will establish an “Independent” Consumer Protection Agency likely housed in the Federal Reserve. It is rumored that the likely head of the agency will be Eric Stein, Deputy Assistant Secretary for Consumer Protection in the Treasury Department who was appointed by Obama and has a long history of supporting CRA, expanded housing programs and liberalizing institutional underwriting/approval standards for home financing through his association and leadership of organizations like the Center for Responsible Lending and Center for Community Self-Help. Such an appointment would simply fortify and continue those failed and destructive housing policies of the past. The Bill will regulate payday, pawnshop and unsecured lenders. This seems a rather ideological tangent, since these financial providers had little impact on the 2007 capital/credit market crisis. Effectively address any of the major risks which resulted in the 2007 collapse of financial markets in turn leading to the current economic recession. It will not address nor mitigate the Federal Reserve Banks easy money bias, the Federal Government’s aggressive housing policies, Fannie Mae’s, Freddie Mac’s and FHA’s overly lax home loan programs, the use of Credit Default Swaps nor the continuing trend toward International Banking/Accounting mandates that preceded and aggravated the financial collapse and persist today. While perhaps ideologically and politically popular pabulum for the left, this Bill will not avert a future financial crises, nor mitigate the real risks facing the capital and credit markets and ultimately the American economy. 35 years ago, April 30, 1975 is a date most have no recollection of and others might be too ashamed to admit to knowing of. It is the date of the surrender of Saigon in South Viet Nam as communist tanks rolled through the gates of the Presidential Palace and the free people of South Viet Nam were plunged into the darkness of communism oppression, as America’s politicans turned their backs on the struggling ally and refused to send aid or support to stave off of the North Vietnamese violation of the Paris Peace Accords signed a couple years earlier. It was never a Military defeat, but a Political cowardice of the leftists who have had too loud of a voice in our government for far too long. PDX Teacher Sends KIds Home With Screed About Tea Party. Oh, And Did I Mention We’re Racists? …Well that’s what the teacher at this Portland Public High School wants his students to believe, anyway. The teacher, whom we’re informed by the father of one of his students is an avowed Marxist, sent THIS home with his students. See if you can spot the caricatures, mis-characterizations, lies, untruths, half truths, etc. Since he didn’t balance this with anything on the other side (as per usual) students were left with an untruthful portrayal of Tea Party Patriots. Beaverton School Officials Haven’t Looked at These? Send This Link to Them! For a guy who teaches school he sure blogs and tweets a lot during school hours. How many classes does Jason Levin teach anyway? Oh, and look, he’s fundraising during school hours! Jason Levin Calls for “Assassination” of Tea Partiers and Republicans. Blogging Again ON SCHOOL TIME! According to screenshots of posts to an anti Tea Party website, Jason Levin was a very busy–and angry— boy while working at Beaverton’s Conestoga Middle School. He was caught dead to rights blogging his anti Tea Party rants by Oregon Tea Party members, but now there’s evidence that he called for the “assassination” of Republicans and Tea Party members on school time too! Some of his rants from February at an anti Tea Party website were done during school hours. Nearby are a couple of examples. Jason Levin is a sick puppy and needs help. The Oregon Tea Party is calling for him to NOT be fired but to be given ‘sensitivity’ training and anger management classes. I think he should be summarily fired for conducting his political business on the public dime and for advocating violence (whether or not it’s done in jest). We’ve seen how the Oppressives impose their rules of speech and freedom on the rest of the population. We’ve seen the Southern Poverty Law Center successfully sue nutter Tom Metsger of Fallbrook, Ca for inciting a follower to murder a Portland, Or immigrant. We’ve seen how anti abortion activists have had their web site ordered taken down because it showed pictures of abortionists along with their addresses. The far left is under no compunction to follow no such rules. Indymedia has revealed doctors’ addresses who conduct research on animals at OHSU and no one orders them to shut up. Legal protesters are ordered to leave their Tea Party on April 15th because of one phone call by a disgruntled citizen (?) (see previous post), but naked bike riders, illegal aliens hanging out on street corners, and fur protesters who scream, screech and hector a legal business out of town are left largely alone. This is an important story because it shows the double standard the left and the right in this area. This is a civil rights issue. We will stand and fight and make the left play by the rules they’ve written for the rest of us. The Beaverton School District spokeswoman was just on the show confirming that Media Arts teacher, Jason Levin, has resumed his spot in his classroom at Beaverton’s Conestoga Middle School. Even though the investigation into Levin’s conduct on school time is still underway, the spokeswoman said Levin was back in the classroom because he was not a threat to students. 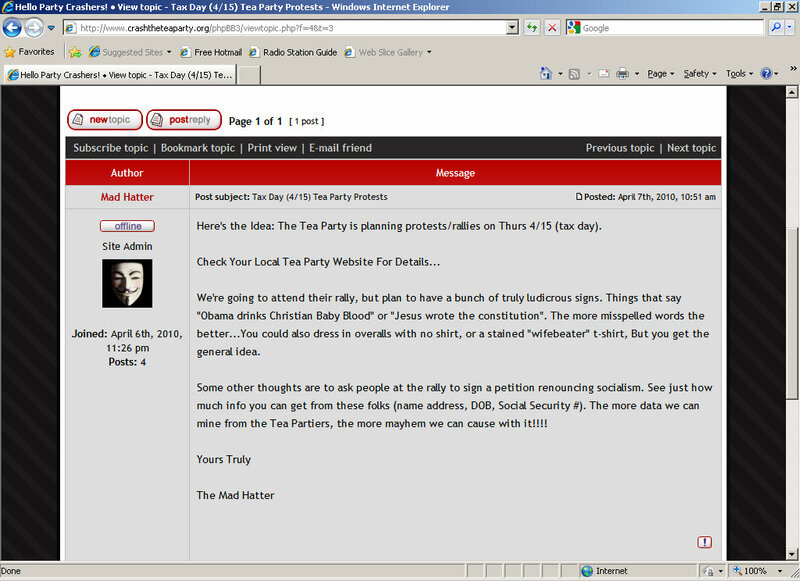 Levin began a website encouraging “crashing the tea party” on April 15th which included threats against republicans and Tea Party patriots, calling for hate speech on signs at Tea Party events and engaging in cyberbullying. Some of the activity appears to have been done on school time. The Oregon Tea Party has recommended Levin seek help for his anger management issues and undergo sensitivity training for his intolerance toward those with whom he does not agree politically. I worry about his behavior spilling out into his classes. Two students I’m aware of have confirmed Jason Levin spoke in class about his website. One was afraid to complain because of fear of retaliation. Beaverton officials claim not to have heard from anyone concerned about Levin’s preaching his politics and website in the classroom. Even though it’s clear Levin has engaged in his campaign of intolerance on school time, his union, the Oregon Education Association, has not commented on the propriety of his activities. It looks like the school district, however, has heard from the union because of Levin’s return today. It underscores once again the truth that schools aren’t run for schools but for teachers’ unions.